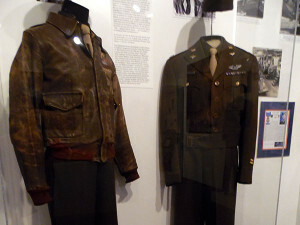 Fred Hoppe was inspired by the stories and sacrifices he heard about from his father (Fred Sr.) and the men that fought alongside his father during some of World War II’s bloodiest battles. Fred Hoppe Sr., is honored with a mural and a special exhibit in the museum depicting his heroic rescue of a wounded fellow soldier. .
Fred Hoppe Sr Display Fred worked 18-hour days, seven days a week, living up to his pledge to complete the project in just 10 months. The museum officially opened on November 11, 2000. Designing and participating in the construction of the building, Hoppe even cut up 70 tons of logs in a homemade sawmill in his backyard to provide siding and lumber for the museum’s 18,000 square feet building. “Along with saving money, this allowed me to personally make sure that every aspect of the building reflected the quality our veterans deserve,” said Hoppe. 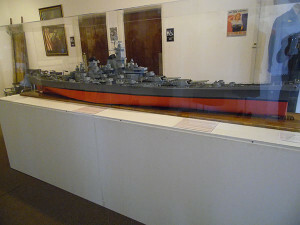 After researching and interviewing veterans for over 25 years, Hoppe personally wrote the scripts for each of the displays. Arranging with combat artist James Dietz, Mike Hagel, and others to create dozens of combat murals, Hoppe has painstakingly detailed the history of our nations valiant fight for our liberties during the 20th Century. The exhibits in the museum cover WWI, WWII, Korea, Vietnam, the Persian Gulf, and all other recent conflicts during the 20th Century. The center great hall of the museum contains the 50-statue sculpture and the wall surrounding it list over 400,000 names of the men and women killed in action during WWII. Throughout the museum the walls of each great hall contain the names of those killed in action during Korea, Vietnam, Desert Storm, and other conflicts of the 20th Century. Fred Hoppe has been involved in the museum exhibit and sculpting field for over 21 years, winning over 100 state, national, and international awards. His recent specialization includes wildlife and monumental bronze sculpture. Research and field studies have taken him to Europe, Africa, and most of North America’s wilderness areas, including Canada’s Yukon and Northwest Territories. Eight of his 40 trips to Alaska have been above the Arctic Circle. 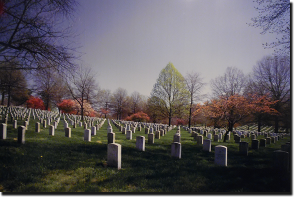 Fred’s work is nationally known, and includes commissions for Former President George Bush (Fred was selected from a field of over 400 artists to do this commission), General Norman Schwarzkopf, Former Vice-President Dan Quayle, the President of India, Nebraska Governor Ben Nelson, and other national and international figures. To honor Nebraska’s 4 National Football Championships, Fred created the bronze sculpture that sits on the campus of the University of Lincoln, “Husker Legacy”. This is a life-size sculpture of seven football players and is placed outside Memorial Stadium. Also sitting on the university campus is a life-size replica of a giant imperial mammoth that roamed the plains of Nebraska 23,000 years ago. Sitting outside Morrill Hall, “Archie” is 26 feet long and stands on its base at 17 feet high. Over 300 of Fred’s bronzes have been donated to non-profit organizations, such as Eppley Cancer Center, the Make-A-Wish Foundation, Nebraska schools, and others, raising over $ 500,000. 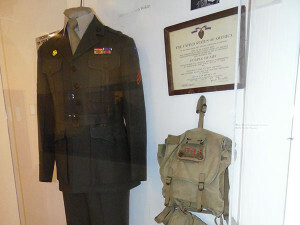 The Veterans Memorial Museum was envisioned, financed, created, and implemented by Fred and opened in October of 2000 with the official grand opening on November 11, 2000. 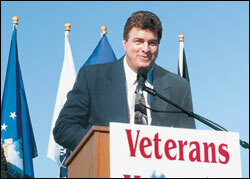 This national tribute is his vision to honor the legacy of our veterans of the 20th Century. Fred has been interviewing and researching veterans for over 25 years and collected over 2000 exhibits and artifacts for the museum. He personally wrote the scripts for each display and also created other bronze sculptures and commissioned murals to adorn the museum which consists of over 18,000 square feet of exhibits and artifacts. Fred was born and raised in Nebraska. He attended Nebraska Western and the University of Nebraska. Fred is married to Donna and they have three sons. 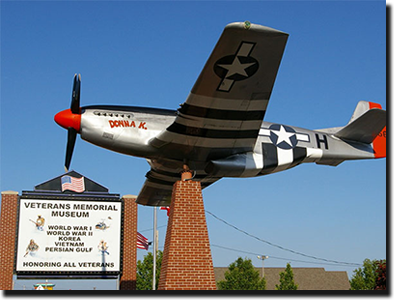 Along with creating special bronze sculpture commissions for others, Fred is creating additional sculptures for the Veterans Memorial Museum in Branson, Missouri; as well as directing the operations of the museum; and procuring additional exhibits for the Veterans Memorial Museum.